Once upon a time, the wind blew towards the road leading to the touristy tiangge of Tiendesitas in Pasig City that took Tutubi to the stalls of the place. One particular stall at the Delicacies Village caught his attention, Ifugao Rice Depot, it's a sight that brought back memories of his 2005 trip to the mountains, caves and waterfalls of Sagada, Mountain Province and the awesome sight of the Banaue Rice Terraces in Ifugao. Near the entrace of Delicacies Village is where Ifugao Rice Depot is located, a stall selling mountain rice varieties from the Igorot farmers tending the centuries old rice terraces. Upland rice varieties are endemic and only grow there, unlike the aroma, C4, sinandomeng, wagwag, dinorado, burdagol, diket and other rice varieties that lowland Filipinos are familiar with. brown rice for sale at P40/kilo and P2000 per sack (kaban). Tutubi nearly bought a 50 kilogram sack, can still fit inside the trunk of his car, but only held back when he learned he has not enough money. (Pictures taken using iPhone 3G since his Canon Ixus's battery lost all its "juice." There were at least 5 varieties on display that day, Tutubi inquired about the prices of several others and aslo asked the stall attendant about the local names of the rice varieties for the tags only say brown rice and black rice. She mentioned tinawon and another name she couldn't remember, but later said pirurutong. 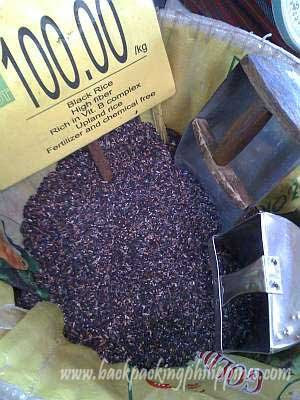 Pirurutong, as Tutubi remembered, is the sticky violet rice used in the puto bumbong, a Filipino delicacy during the Christmas season. Other rice varieties Tutubi has heard of are balatinao, and inuruban. is this the pirurutong? a return trip to Tiendesitas, Market! Market! or other places where "exotic" rice varieties are sold can verify this. With price at P100/kilo, is quite expensive for the peso-pinching Tutubi ever on the lookout to save on costs, but splurging once in a while while thinking of the social impact of buying authentic organic rice has its reward. 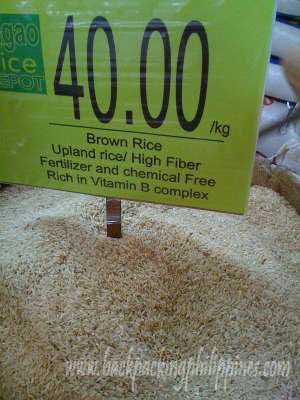 Upland rice varieties, whether brown, black, red, or violet, are rich in fiber, and organically farmed i.e. fertilizer and chemical free, by ancient farmers for centuries, long before commercial fertilizers and pesticides inundated the markets and hybrid rice was born. There also is the holok, an effective indigenous pest control system practiced in Ifugao using certain plants effective in killing traditional rice pests. Well-milled rice, the shiny clean rice is less nutritious than those where the rice bran, called darak in Filipino, are still attached to the grain. Darak is nutritious and yet lowland Filipinos, averse to brown-colored rice, feed it to pigs. Tutubi recommends buying and eating rice cultivated in the rice terraces of the Cordilleras, not only for the health benefits, but only for the people of the Cordilleras, the hardy Igorots, be they Bontoc, Ibaloi, Ifugao, Isneg, Kalinga or Kankana-ey, to tend the rice fields carved out of the mountains, and not migrate to the city to find work, thereby restoring the grandeur of the rice terraces supplied with water through an ingenious and sustainable irrigation system modern engineers regard as marvelous engineering feats of ancient people believed to be made using bare hands. The Banaue Rice Terraces, where some of the indigenous rice varieties are cultivated, is an inscribed UNESCO World Heritage Site as a Continuing Cultural Landscape where the unique rituals and traditions are inextricably tied to the rice terraces. It's also one of the three National Cultural Treasures on the P1000 bill together with the langgal and Manunggul jar. Other rice terraces present in Ifugao include those in Batad, Mayoyao and Hapao. Tutubi was able to sample the long-grained Basmati rice variety in India but he prefers the round, soft-textured and glutinous Japanese rice varietiy. He's also particularly interested in the Jasponica rice, a cross between the aromatic, long-grained and thin Thai jasmine rice and Japanese rice. ( If there's anybody here who can point to Tutubi where to buy Jasponica rice, he'll be be thankful.) There's also GMO rice or genetically modified organism, but not recommended due to lack of conclusive medical studies of its effects on humans). The Cordillera Administrative Region (CAR) where the Banaue Rice Terraces is located, is comprised of the provinces of Benguet, Mountain Province, Ifugao, Kalinga, Apayao and Abra. Baguio City, being a highly-urbanized city is not a part of CAR and does not fall politically under Benguet province. The price of brown rice in the market is more expensive than this one on the pic. i love the sticky violet rice when it's made into "suman". I think pirurutong is a different variety of malagkit. To be honest I am at loss when I see the different varieties of rice... I guess I have still a lot to learn about this topic... I can hardly differentiate when I eat different kinds of rice. dami din palang varieties. kakatuwa at talagang napagotutukan mo ito. I love rice, by preference, good quality rice. Basmati is my favourite. hi, do you know where I could buy black rice somewhere here in the south? I reside in Las Piñas. I first get to taste black rice when I dined in at Malou Veloso's place. hi, I had black rice before when I celebrated my birthday at Malou Veloso's place in Pasay. My mom and I are looking for a place here in the south where we could purchase one. By the way I'm from Las Piñas. we will be harvesting organically grown black rice or commonly called balatinao in the cordillera in a few weeks from our farm in the forest of the cordillera. Buyer can choose between machine or hand milled/"binayo". you can email payatascoop@gmail.com or call 09204545782 to order. we are setting up a demo farm in the remaining forest of the sierra madre just above metro manila with various tribal groups.